There will three group hunts in three separate Garden Collections. This means that each age group will have a hunt that will match their skill level: 0 – 4 year olds will be in the Perennial Garden with tall grass hiding the eggs, our 5 – 8 year olds will get a chance to hunt for eggs along our Woodland Paths, while our 9 – 12 year olds will find it much more difficult to locate eggs in our Conifer Collection. Because of the unique environment of each hunt, pre-registration will be available for each age group/time slot. Due to the limited space, we will not be able to guarantee openings in your age group or time slot on the day of the hunt. All Easter Eggs will be filled with tickets, where children will have the chance to choose their own prizes based on the number of tickets collected from our Prize Table. Also don’t miss the opportunity to take some great family photos in the Garden while the flowers are blooming! 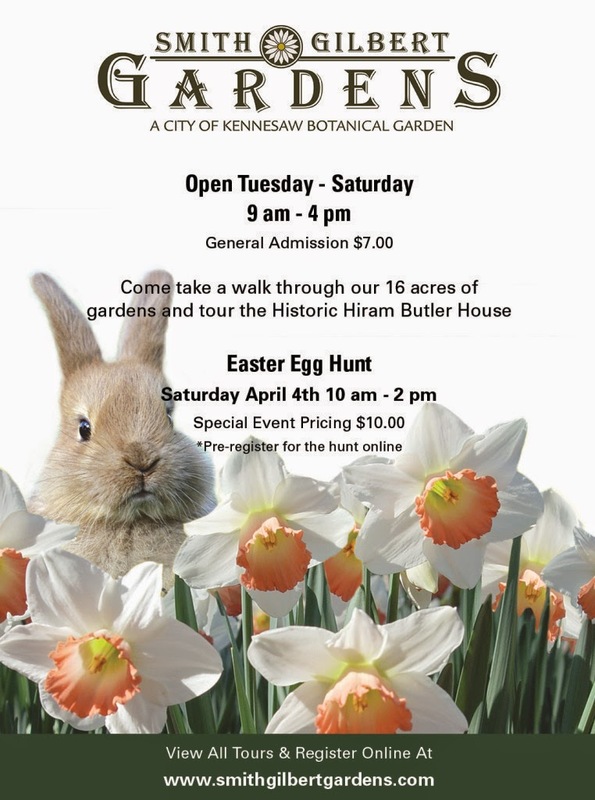 • The Event is Rain or Shine - in cases of severe lightning, we will all Easter Egg Hunt Tickets to be used as a general admission pass for another date. • Please bring your membership card if you are receiving the member discount. • We suggest arriving at least 30 to 45 minutes prior to your hunt to park or take the shuttle as well as check in with admission. You must check in with admission before entering the event. You can find more event details by emailing info@smithgilbertgardens.com. SGG Members can register from March 3rd – March 9th by calling the garden. Registration will open to the public on March 10thand you can register for the event online or by calling 770-919-0248. Sponsorship opportunities and vendor requests are also available.